A vascular malformation is an abnormal collection or tangle of blood vessels. The malformations restrict or alter blood flow and are associated with the degeneration of neurons. In most parts of the body, blood flows from small arteries to capillaries, then into veins of increasing size and back to the heart. Capillaries are the tiny vessels that deliver oxygen-rich blood to tissues and carry away waste products. In arteriovenous malformations (AVMs), blood flows directly from arteries into veins without passing through interconnecting capillaries. AVMs are uncommon; approximately 2500 new cases of symptomatic AVMs are identified each year in the United States, but it is not known how many people have them but have not yet experienced symptoms. Symptoms usually appear in mid-life and slightly more often in men than in women. When AVMs do become symptomatic, however, they often present serious problems. The most frequent presenting symptoms of an AVM are those related to an intracranial hemorrhage-bleeding in the brain-a serious neurological emergency. Between 50 and 75 percent of patients with an AVM will have the malformation identified after a hemorrhage. Another common presenting symptom is seizure, especially in patients with large AVMs. Headache is also commonly associated with AVMs. Angiography, which provides an image of blood flow in the brain, is the most important diagnostic tool for AVMs; it provides important information about both the location and structure of the malformation. Specialized forms of angiography also can be used to provide greater detail. Computed tomography (CT) and magnetic resonance imaging (MRI) scans often are used for diagnosis as well. The decision to treat a cerebral AVM depends on its location, the risk of future complications if it is left untreated, and the extent of neurological deficits that may be associated with its treatment. There are a number of surgical techniques, which may be used in combination, for the treatment of AVMs. 1. Without entering the skull, neurological surgeons can use stereotactic radiosurgery (highly targeted radiation therapy). This technique, appropriate for a smaller AVM, is effective in up to 80 percent of patients treated. It can result in the AVM’s complete obliteration over a period of 1-2 years after treatment, and given the proper dosage, side effects are usually moderate and limited. This is a rapidly developing technique, requiring this most highly trained surgeons with the most sophisticated equipment — such as a gamma knife, proton beams and linear accelerators — and is usually only available in major medical centers. 2. Another approach, endovascular embolization, involves the insertion of a catheter, or tube, through an artery in the groin. The tube is guided up the circulatory system to the site of the AVM, where it delivers a kind of “glue” that embolizes, or blocks blood flow to the malformed vessel, thus restoring normal circulation. Embolization often is used before surgery. 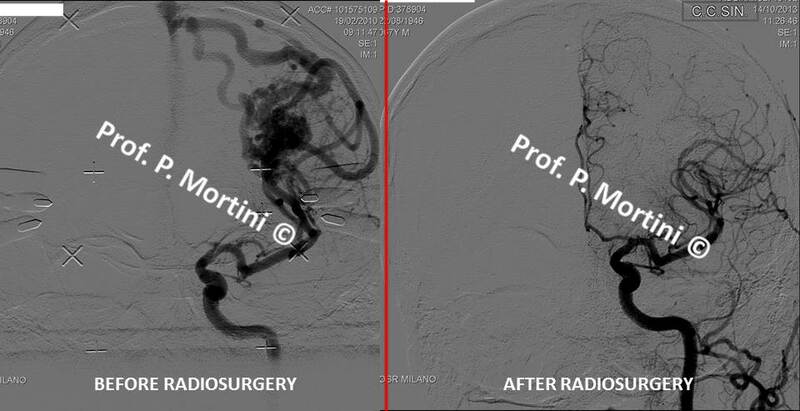 Sometimes, embolization may reduce the size of a large AVM sufficiently to make radiosurgery a viable option, thus avoiding surgical resection. 3. Microsurgical resection of the AVM, in which surgeons enter the skull to remove the abnormal vessels, may be safer and more effective after embolization. Following this procedure, close monitoring and strict control of blood pressure are required, as well as a high-quality angiogram to determine that the AVM has been completely removed. AVMs are complex lesions and should be addressed at major centers with experts experienced in their treatment.